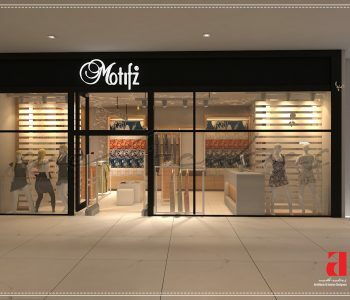 A design that reflects elegance and grace, the interior of the 5000 Sq.ft shop of Motifz in the brand new Mall of Defence was recently done by the best team of interior designers at archicubes Lahore. 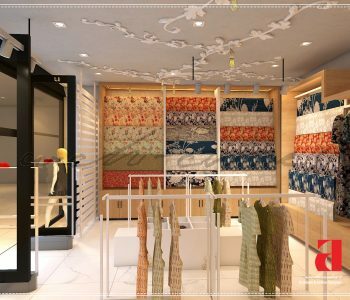 The neutral color palette was selected with hues of grey, white and black which set up a nice backdrop to highlight the colors and design motifs of the fabrics displayed within the shop. The modernist language of the furniture was tastefully designed to keep it minimal. However, to add a layer of sophistication a unique white floral motif with embedded lights was spread out on the ceiling and walls to enhance the sculptural feel. Keeping the range and distinction in choosing the building materials within, the look is provided the hint of gentleness too. perceptive the manly options for majorly men’s area, one will see the powerful language within the style. At a similar time, the employment of elaborate and trendy style with decorated like style will provide impression of feminist outlook within too. Such sturdy concepts and ideas are well generated by our interior designers and designers that it gets additional attraction towards itself each time. The lighting was done to give a feeling of warmth within the over all atmosphere. 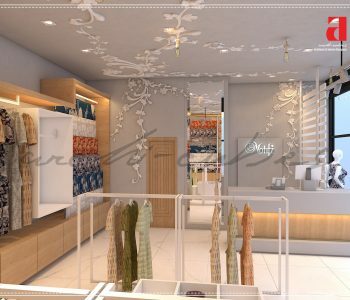 The interior of the shop sets a bench mark in the new mall by displaying sophistication, beauty and finesse.